Lightly grease six 4-inch baking shells or ceramic ramekins** with butter. Place in 15x10x1-inch pan. In 3-quart saucepan, place scallops, wine, parsley and salt. Add just enough water to cover scallops. Heat to boiling; reduce heat to low. Simmer uncovered about 6 minutes or until scallops are white. Remove scallops with slotted spoon; reserve liquid. Heat reserved liquid to boiling. Boil until reduced to 1 cup. Strain and reserve. In same saucepan, melt 2 tablespoons butter over medium heat. Cook mushrooms and shallots in butter 5 to 6 minutes, stirring occasionally, until mushrooms are tender. Remove from saucepan. In same saucepan, melt 3 tablespoons butter over medium heat. Stir in flour. Cook, stirring constantly, until smooth and bubbly; remove from heat. Gradually stir in reserved liquid. Heat to boiling, stirring constantly; cook and stir 1 minute. Stir in half-and-half, scallops, mushroom mixture and 1/4 cup of the cheese; heat through. 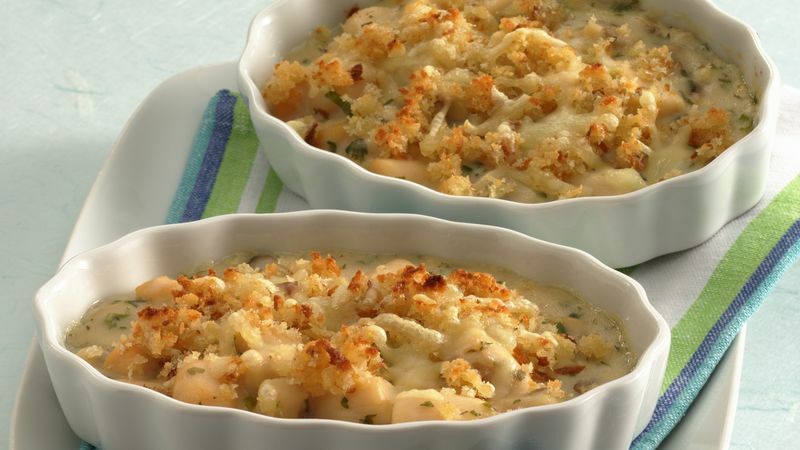 In small bowl, toss bread crumbs and 2 tablespoons melted butter. Divide scallop mixture among baking shells. Sprinkle with remaining 1/4 cup cheese and the bread crumbs. Set oven control to broil. Broil baking shells with tops 5 inches from heat 3 to 5 minutes or until crumbs are toasted.